In the volatile world of Internet start-ups, it can take just a nanosecond to lose it all. A decade before Facebook, Stephan Paternot and Todd Krizelman created the first social network in their college dorm room. After a meteoric rise, theglobe.com became world-famous for its billion-dollar IPO, only to quickly plummet toward the depths. This very personal history details what it was like to witness the chaotic birth of the Internet industry. One of the poster boys of the dot-com era, Stephan rode the wild high of seeing his digital dreams come true, only to confront the sometimes-ugly reality of being the youngest-ever CEO of a public company. As Stephan navigated a fledgling and cutthroat industry, he struggled to keep his company afloat. Chronicling a surreal, upside-down period in American corporate history, A Very Public Offering tells the dramatic personal story of a young man’s rocket toward success, and what happens when it all falls apart. Reissued to celebrate the 20th anniversary of theglobe.com’s IPO and adding powerful and practical lessons for a new generation of start-up founders, this edition expands upon Stephan’s story featured in the National Geographic TV series Valley of the Boom. As someone who works and spends way too much time on social media, I've often found myself wondering where this crazy digital community come from. I caught the tail end of Friendster, but I never heard of theglobe.com until much later. What one would find in this book is the incredible story of one of the most influential websites in the early years of the web told by one of the two wunderkinds who created it. His life is a whirlwind of events that lead to him force a massive shift in the digital world forever. 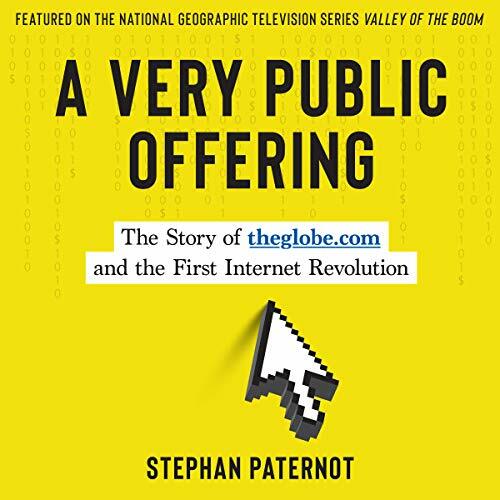 But what makes "A Very Public Offering" so engaging is actually not the story of theglobe.com, but of the author Stephan Paternot. His personal life is just as engaging as he takes stock in the many lessons learned from his family and friends and reflects on the wild roller coaster ride that is The Globe as it spirals from a billion dollar IPO to a burnt out brand. For anyone looking for a deeper look at the beginning of the web or just an inspirational story that builds on the human spirit and overcoming the odds, I cannot recommend this book enough. Also, if you're a fan of audiobooks, Stephan takes the time to actually read the audio version. Who better to narrate than the man who lived the story? I loved this book. Stefan Paternot delivers a well rounded and rhythmic performance which complements his story with aplomb. The Globe.com was the fuse that lit the social media explosion more than a decade before everyone else... impressive. A great ‘read’ well done! We don't hear much about the early internet startup heros. This book chronicles the heavy story of what it was like to break into website creation and building an online community. The perils of starting a massive IPO are explained thoroughly. Such a wonderful read and inspiring even in today's digital age.